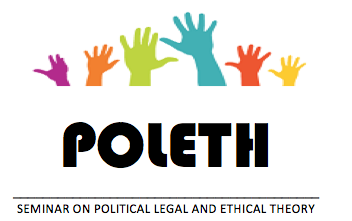 POLETH stands for a research group in Political, Legal and Ethical Theory. It is focused around, but not limited to, students and faculty from the Institute of Philosophical Research and Philosophy Department at UNAM. Its main activities are meeting for philosophical analysis of original work and the latest literature on the topic. We meet some Wednesdays from 17:30-19:30 normally in room 6. We seek contributions from PhD students, MA students, as well as both established and junior scholars. The papers may address any topics in Political, Legal and Ethical Theory (See submission guidelines below). 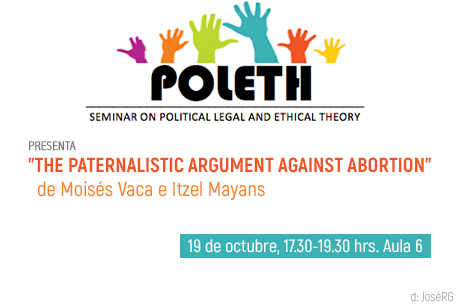 "The paternalistic argument against abortion"
Miércoles 19 de octubre de 17.30-19.30 hrs.